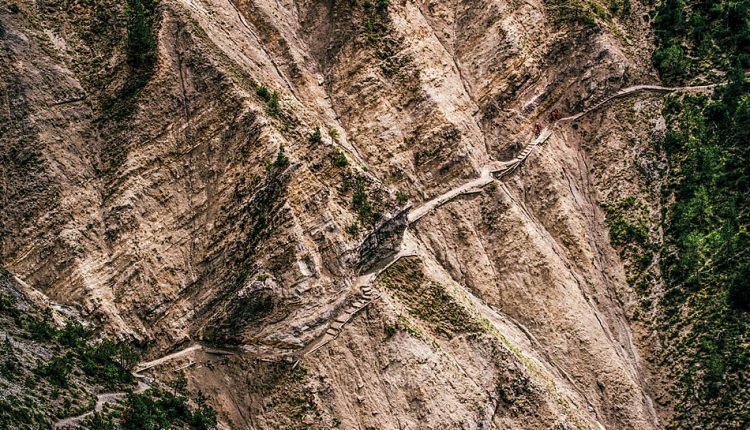 My eyes were burning with streaming sweat, blood was thundering through my ears like a runaway train, and my legs were smoldering with lactic acid. I was starting to wonder how I could keep this up for another 25 kilometers. 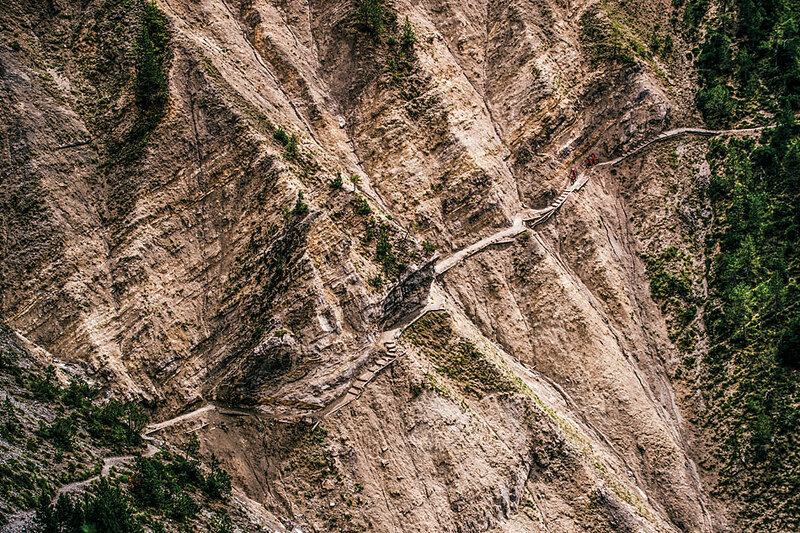 The trail was so steep and too loose to climb. 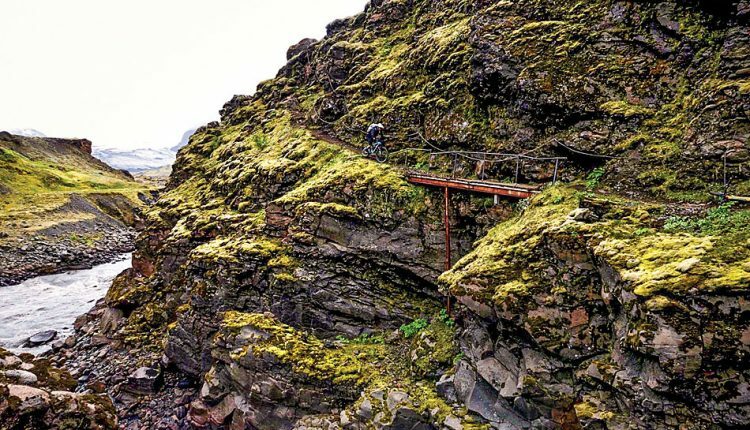 I had to stop pushing my bike every few meters to desperately inhale all the thin air I possibly could to keep my pulse from going into overdrive. 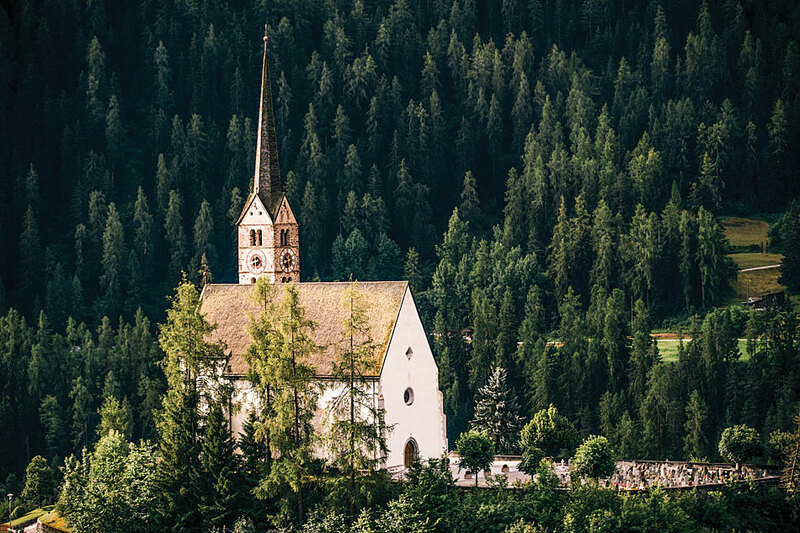 This journey through Graubünden in Switzerland was turning out to be a real challenge, but at least it was a beautiful one. 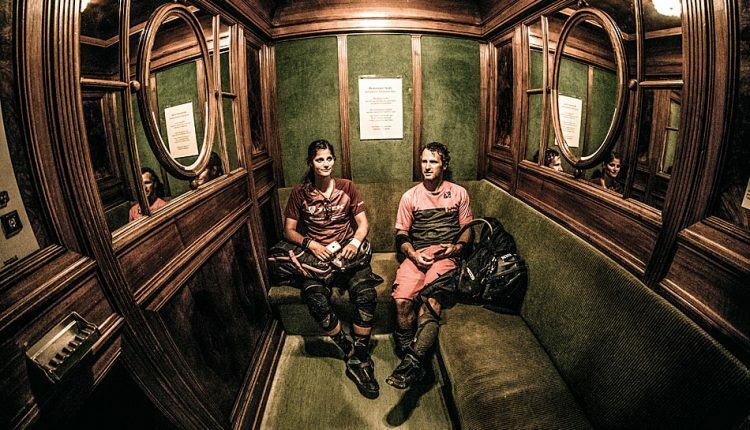 Over an excessively stacked Swiss cheese platter the night before at the Hotel Belvédère in Scuol, it dawned on Richie Schley, Ale Di Lullo and myself that the last time we three actually did something together was a terrifying 10-year leap into the past. 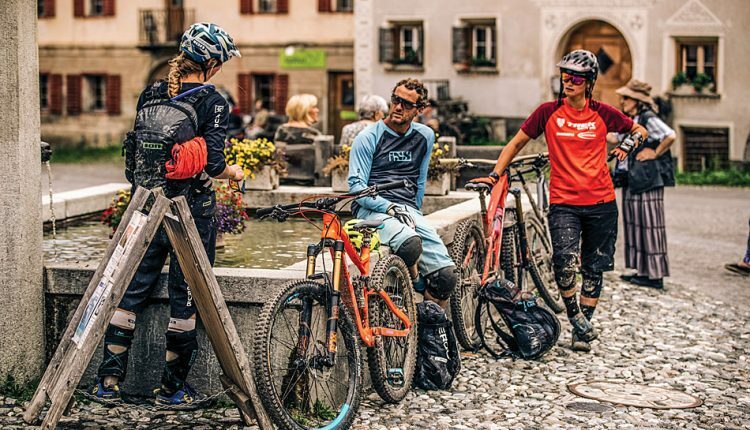 I was in Trentino for one of my first 4X world championships when we did a photo shoot. Back then, Richie taught me how to do this thing with the photos and look my best on two wheels. Since then, I have been trying hard to “Schley” my turns like the master himself. Our paths have crossed every now and again since, and it seems pretty crazy that it has taken so long to find an opportunity to ride together again. 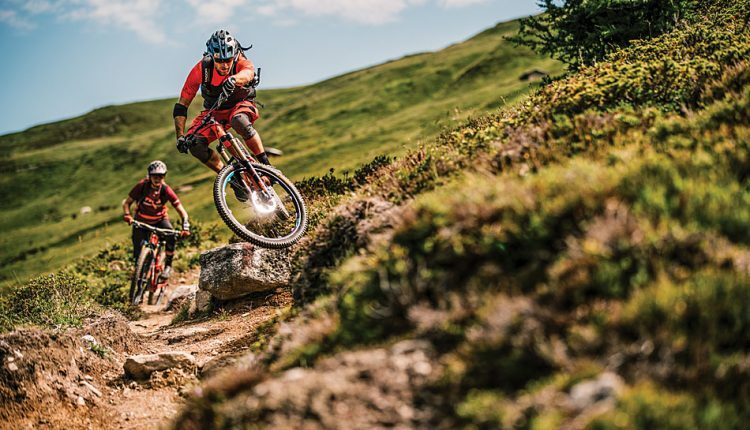 As Richie and I were both more or less in the region, we literally jumped at the opportunity to get some good riding in after the World Cup in Lenzerheide. We had a great laugh over a hearty and much-too-expensive bottle of red. Now, panting hard on the trail, I wish I had one fewer glass. I’m surprised to realize that I could still manage to appreciate the beauty of the unrivaled high-alpine views around me. This is roughly how it must feel to be an astronaut on the moon. The lunar landscape at this altitude doesn’t even bear a lonely tree or a welcoming mountain hut, not to mention a single living soul—just one little ant, barely visible through the sheeting drizzle. I could just about make out that this almost microscopic speck was our photographer, Ale, and I would bet most of my life savings that he was swearing in Italian right now. However, as tiny as he may seemed, I still sensed his extravagant Mediterranean impulsiveness towards the unexpected, snarling beast this so-called “trail ride” had become. Wow, did he need an espresso! I certainly could have had one too. 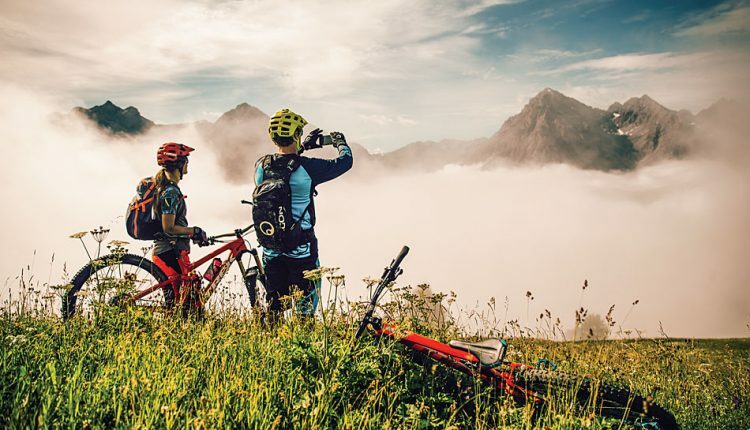 Richie, meanwhile, was already standing triumphantly at the top, right on the border between Austria and Switzerland, busily posting the view on Instagram. To be fair, this was an adven- ture too good not to ’gram! 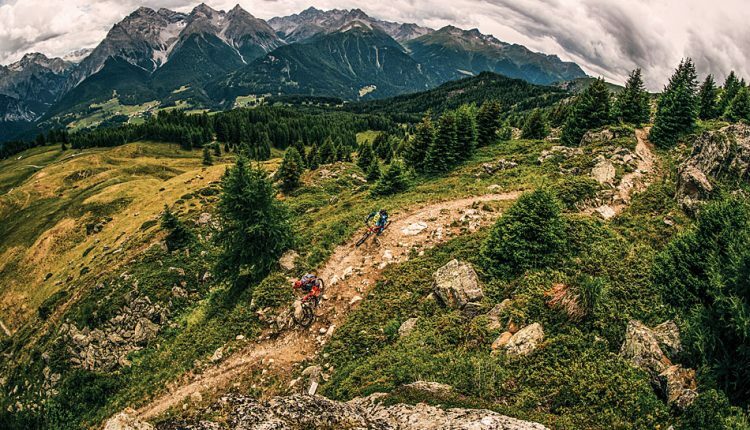 Scuol is way off. 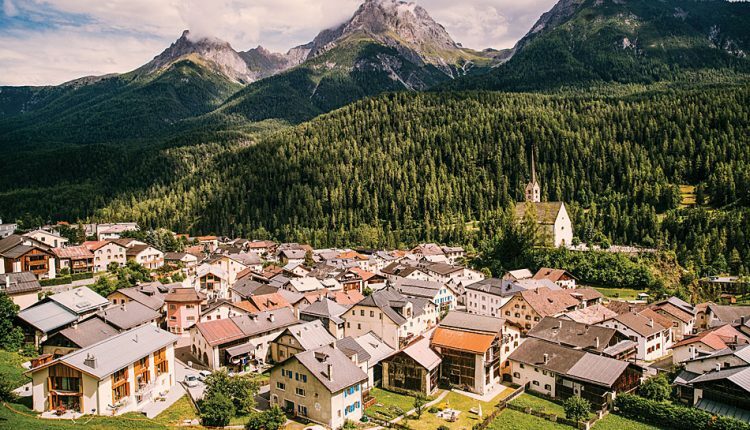 The small town in the very east of Switzerland is our base camp for the first two days of a three-day trip before we head to Davos for a point-to-point trail ride to Filisur, where we will be taking the train back home. I find it hard to believe that we will be pedaling our bikes back over a distance that took us about two hours by bus and gondola this morning. 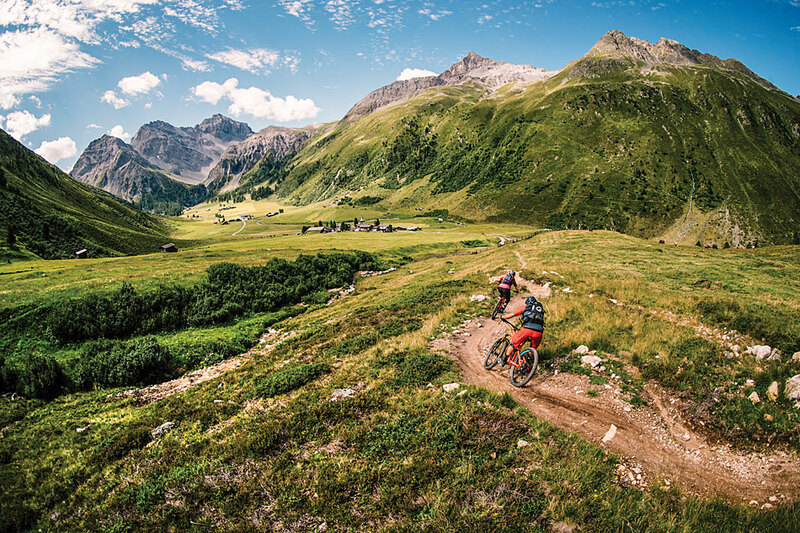 We started today’s tour all the way over in Samnaun and already crossed almost the entire length of the destination—Scuol Samnaun Val Müstair—to get to where we are now. 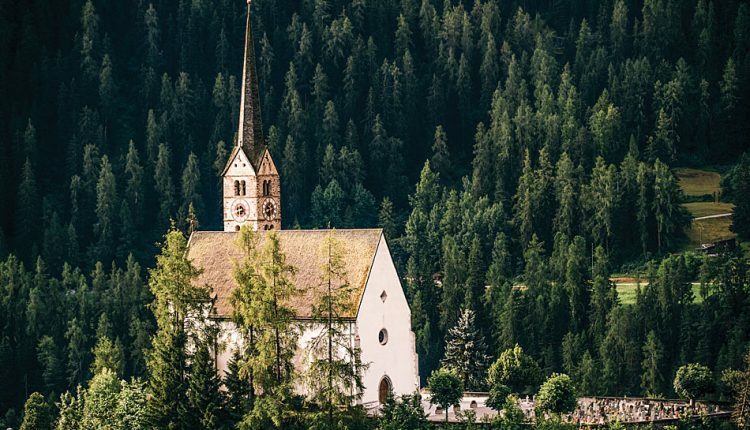 This place is one of five destinations nestled into the towering Swiss mountains of Graubünden and is the first stop on our three-day trip, which will also take us to Davos Klosters on day three. On a side note, taking your bike on public transportation here is super convenient. 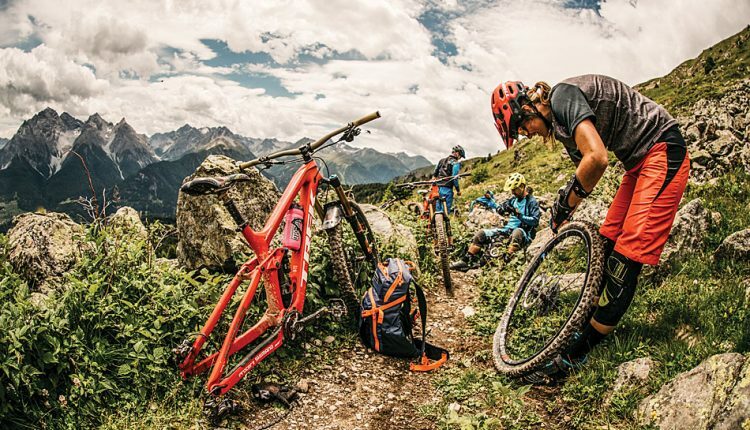 Everything is very dialed for mountain bikers, which is a considerable blessing when all you know is trouble at the airport or in the hotels. 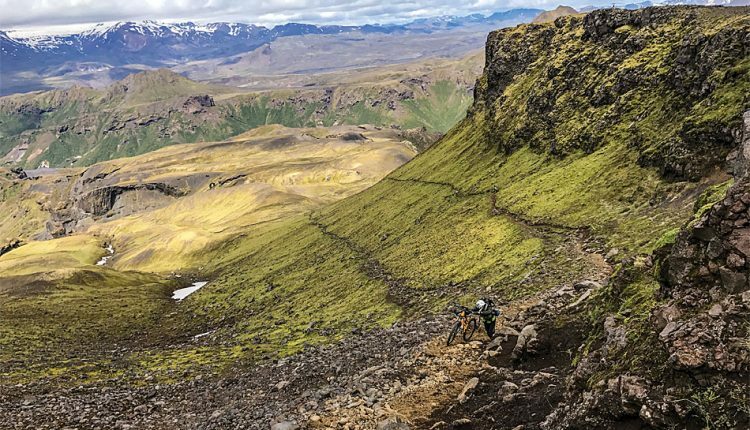 As we arrived at the foot of another towering wall of a climb, my mind was made up—I was definitely going to have to call this ride more than a little strenuous. This time we were confronted by the towering Fimberpass, which triggers Ale to unleash another tirade of Italian “passion” before we set off on another section of bike-and- hike. The poor guy with the enormous photo backpack needed caffeine and he needed it now. Where are the emergency mountain baristas when you need them? Finally crowning the top ridge, there was sadly no time to savor the amazing border-spanning views straddling both Austria and Switzerland, as we got caught in a brutal rainstorm. 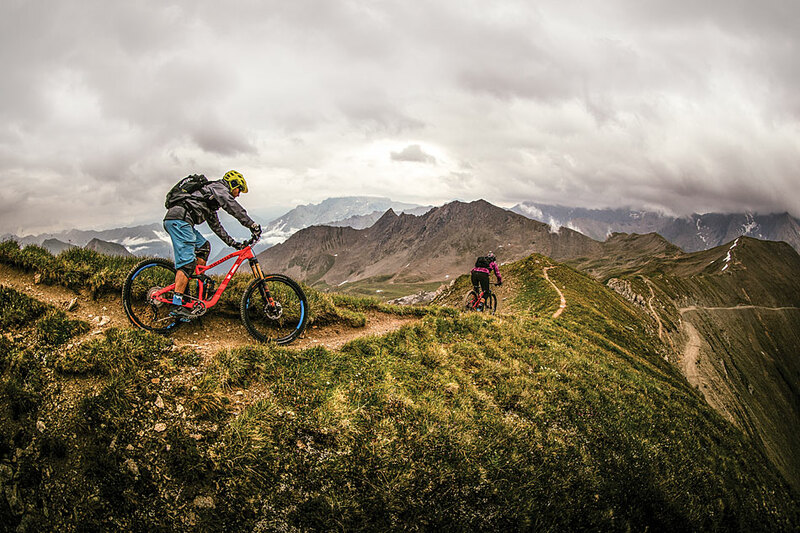 For some people, hell begins when they find themselves looking down into steep, technical terrain as the heavens open, but thankfully for me, I’ve always found it kind of fun. 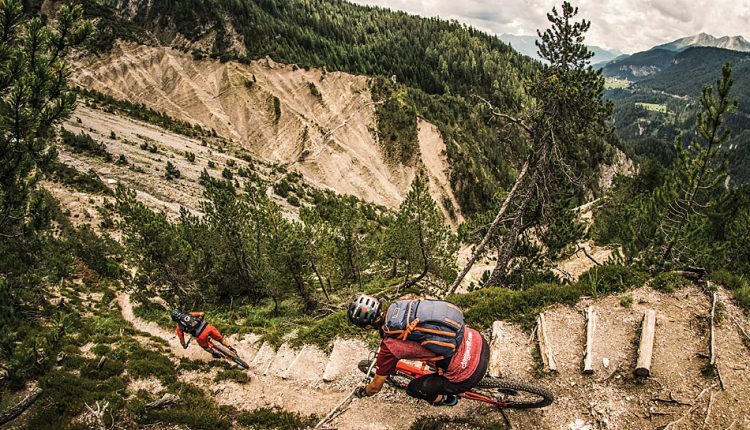 This trail does quite literally seem endless, and although I was soaked to the bone, it’ll easily ranked in my top three descents of the season. Having to work hard to even be able to embark on a breathtaking technical descent gives you a very rewarding feeling of satisfaction. 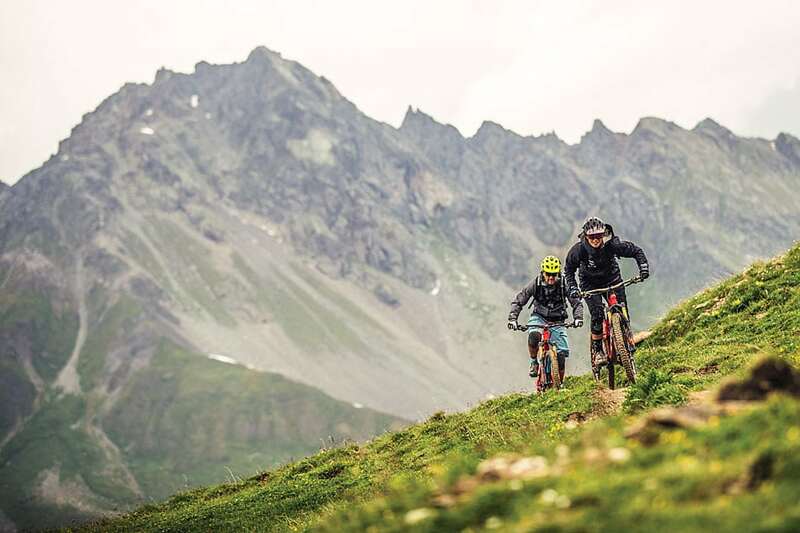 Riding a natural trail with multiple line choices between towering mountains just beats nearly every trail there is out there. 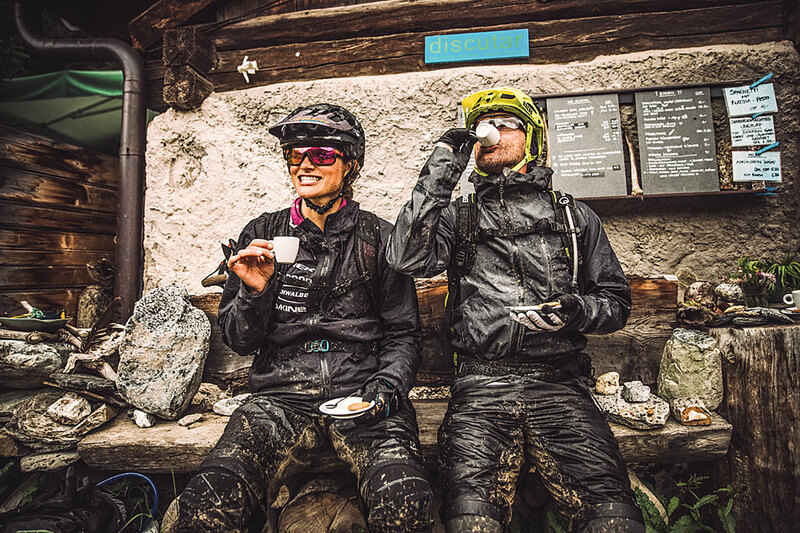 Further down the trail, a super-cute little wooden hut decorated with colorful flowers and a little sign saying “Coffee and Cake” brought a smile to our mud-splattered faces. A woman opened the door, and she didn’t even seem surprised that we were showing up on such a bad weather day. The hut was so tiny that we could look right into her kitchen. I don’t think I have ever enjoyed an espresso as much as this one. Ale, Richie and I sat quietly on a bench outside in our filthy rain gear and embraced these calm, finally warm and caffeinated moments. Although it felt like we were almost back in town, we were concerned the guide’s estimate of another hour left was slightly optimistic. Of course, it was! But, as they say, “Wine is the best healer” (Dr. Schley, 2017), and back at the hotel in the evening, we were all on the same page of positivity after a glass or two. This wasn’t a ride we’d forget in a long time. 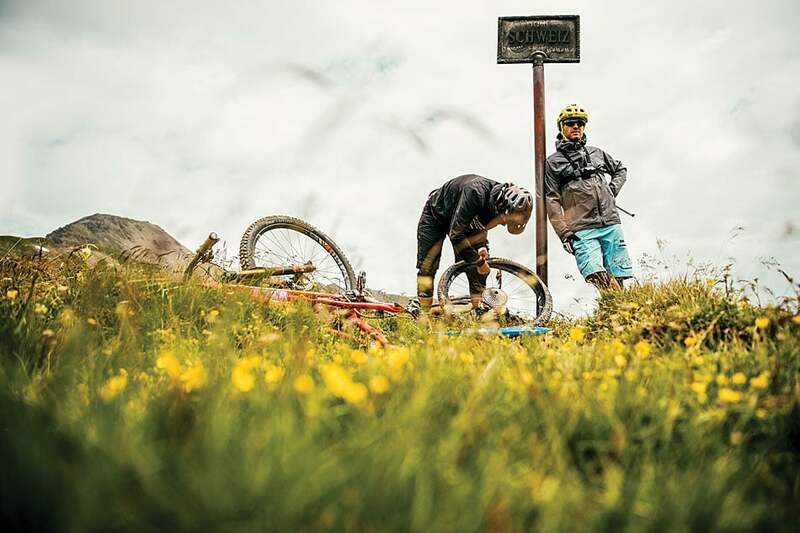 A real wet-weather Graubünden adventure. 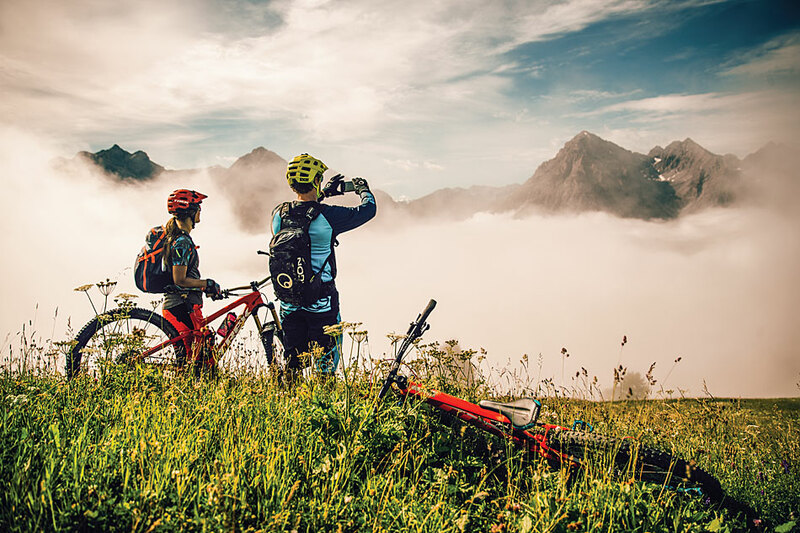 After a good night’s sleep, we are able to save a big chunk of energy right off the bat, as we took the Motta Naluns lift up the mountain in Scuol. To our delight, our guide, Werni, happened to know the guy handling the lift, and he shuttled us up even higher into the majestic peaks in his truck. As we got dropped off in a lush green field, the thick clouds that worried us when we left the hotel stayed behind. 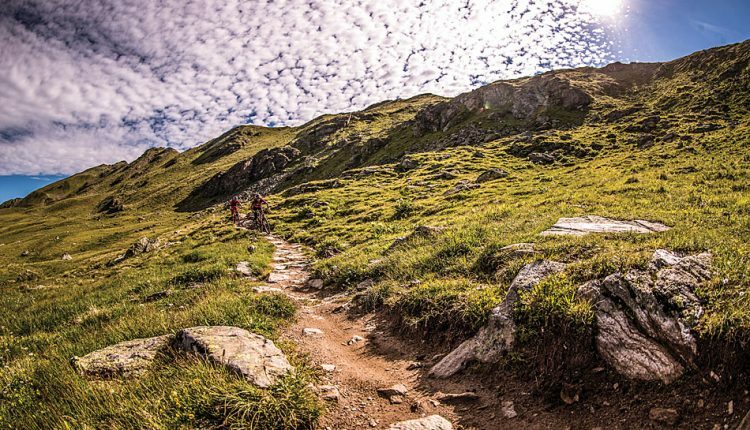 Werni assured us it was all downhill from here, and my legs could not be happier about that; however, you always have to keep the super-human endurance of a Swiss bike guide in mind. 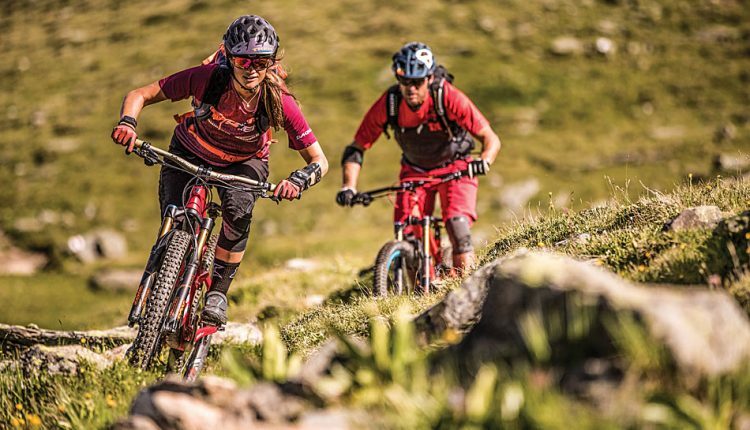 With these folks, downhill can be quite flat, and flat can, in fact, be surprisingly uphill. But, we were ready for whatever this day would bring. 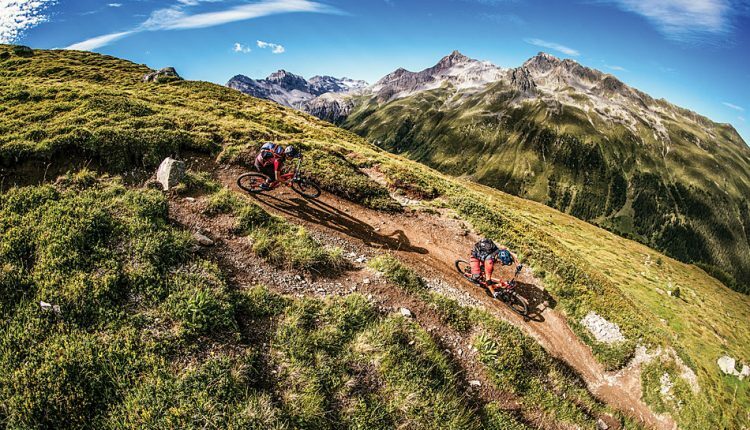 Back in the early mountain bike days, Scuol was one of the most famous downhill spots in Europe. 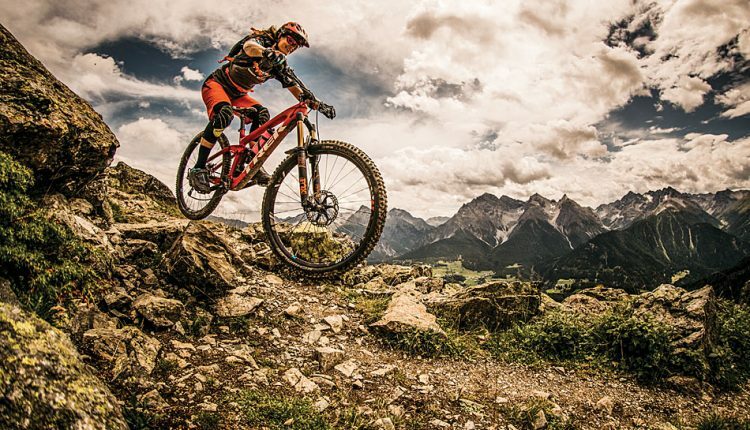 The Swiss downhill sensation himself, Claudio Caluori, had a house at the foot of the trails. 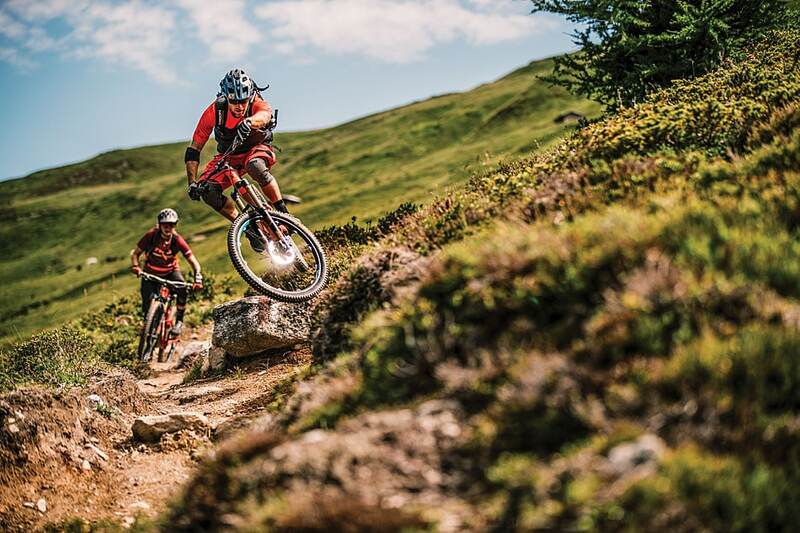 Unfortunately, the main downhill scene didn’t stay; instead, it moved on a few kilometers. 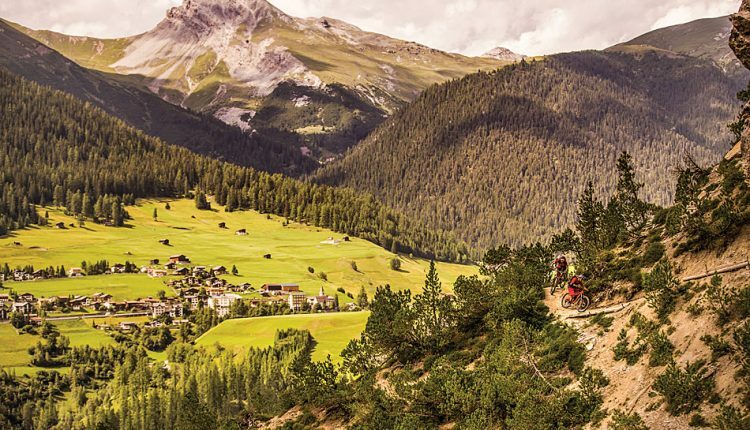 You won’t have to look far to discover the world’s fastest going head to head at the Mountain Bike World Championships in Lenzerheide, another of the five big bike resorts in Graubünden, in September 2018. 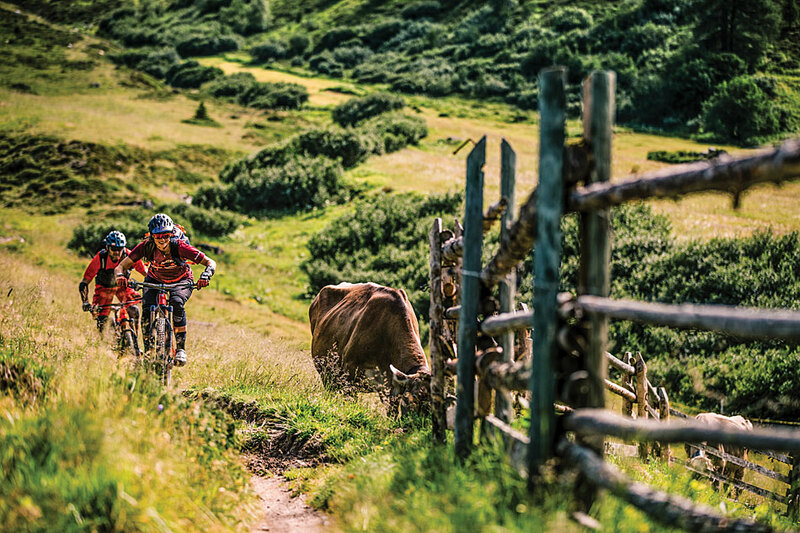 You can imagine the potential of the trails here with it being a former official downhill track. 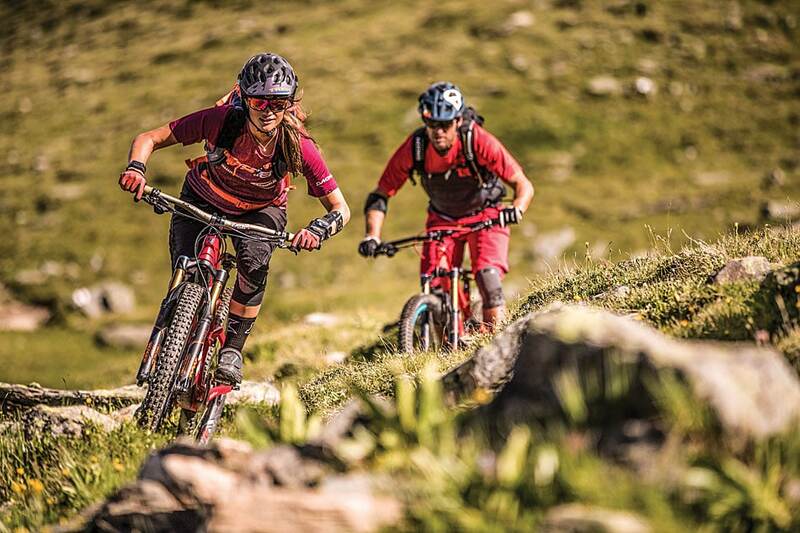 This perfect mix of fast turns and rocky singletrack was everything we needed to be happy. 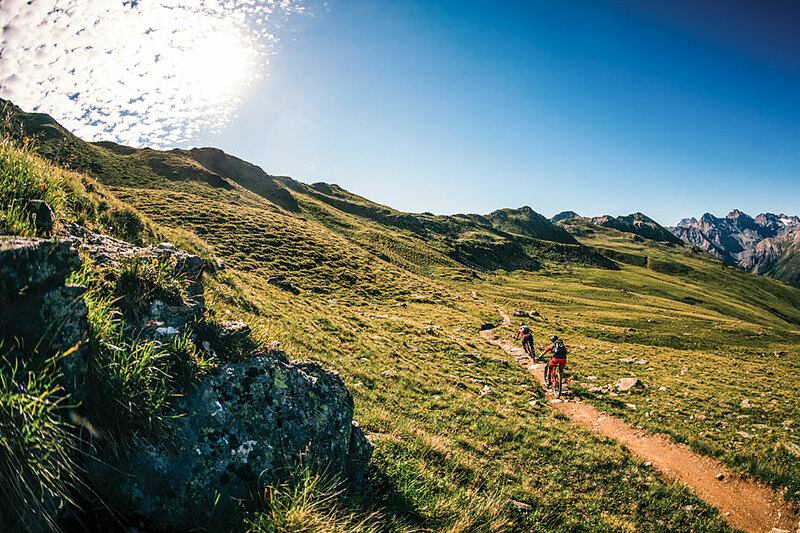 It’s not easy to concentrate on the trail, with the mid-summer mountain scenery being so beautiful. 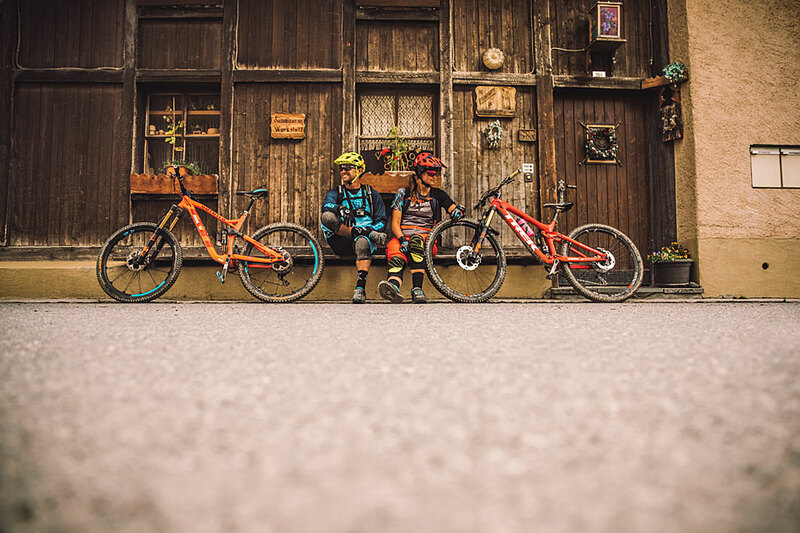 After a delicious lunch break at another mountain hut, we rode a couple more trails before cruising back into the town of Scuol with its characteristic Sgraffito architecture of Engadin houses. The architecture paired with the Romansh language made it hard for me to believe that I was still in Switzerland. 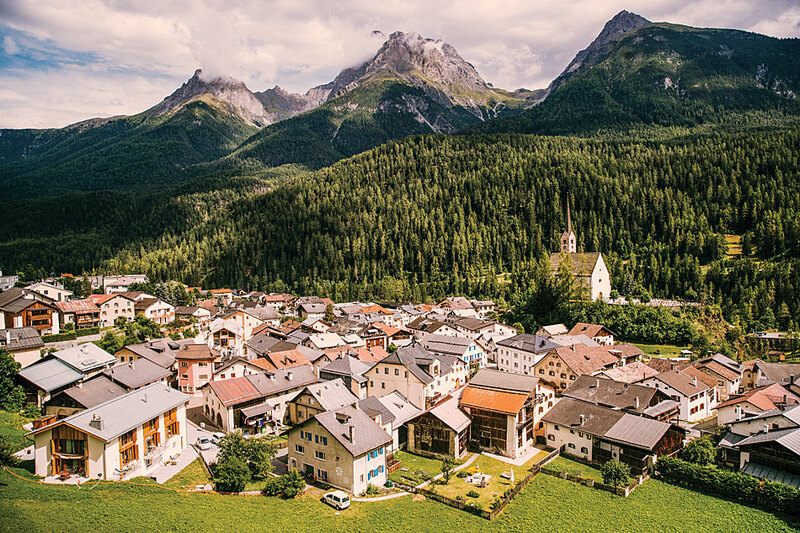 Three different languages are spoken in Graubünden: Italian, Romansh and Swiss German. 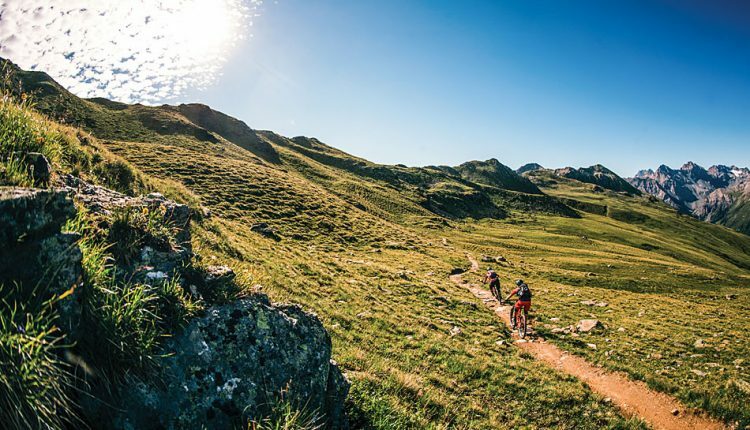 This diversity is impressive, and the thousands of kilometers of trails on 7000 km2 of alpine terrain was even more so—a true trail paradise! But still, even though everything seemed totally organized, Graubünden isn’t Disneyland. It’s authentic, untouched nature. 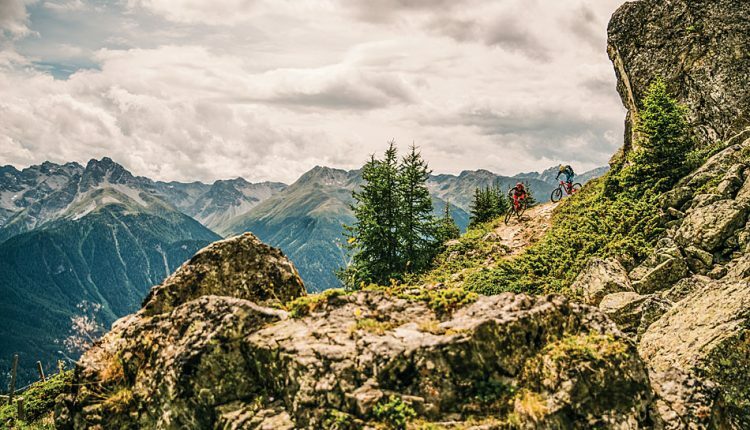 Every trail in Graubünden can be taken on foot or on a mountain bike, offering endless possibilities to visitors from all over the world. 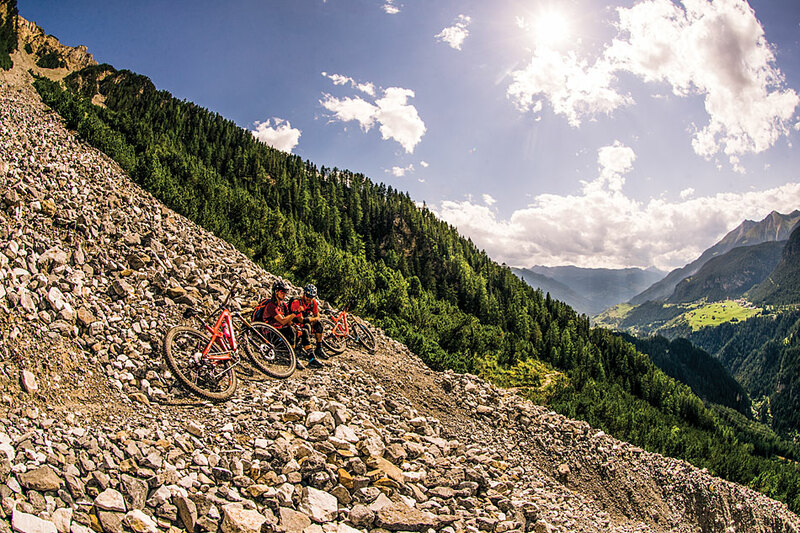 Freeride enthusiasts like us never had it so good on the hunt for treasures deep in the Swiss Alps. 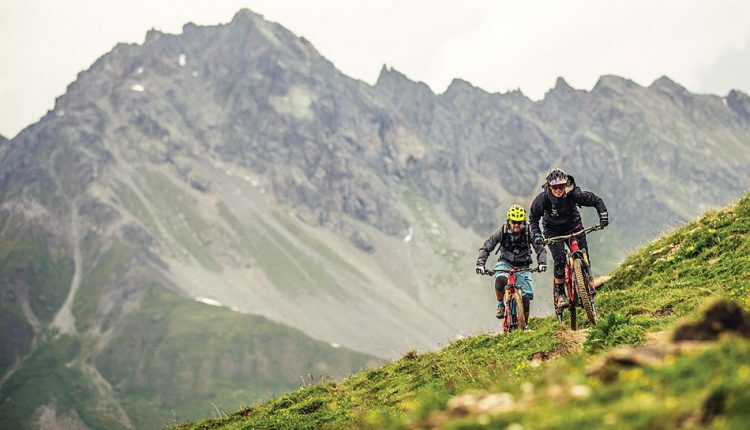 We wanted to ride as many endless trails as possible, and we were told that the next bike destination in Graubünden hosted one of the most famous and longest trails in the world—the Alps Epic Trail Davos, a trail in Davos Klosters. 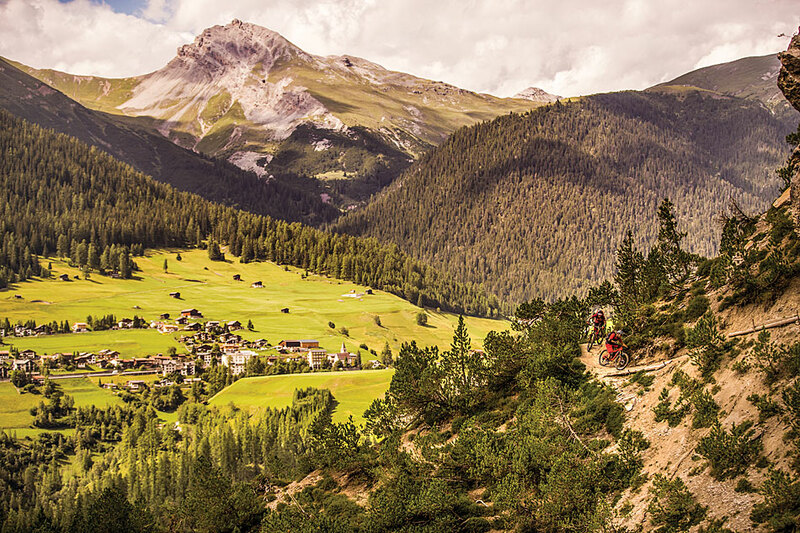 Davos lies at an altitude of over 1500 meters, the highest elevation of any city in Europe. 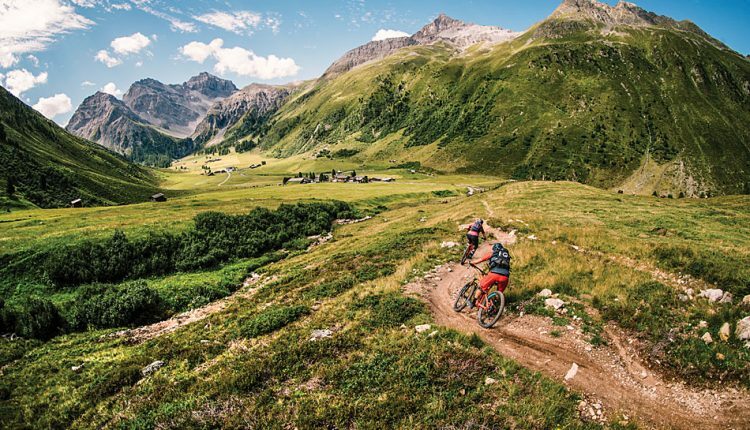 The German-speaking region has spectacular singletrack to offer, and we were ready for the most epic of all—all 45 kilometers of it. We took the first lift up to Jakobshorn, where we were welcomed by the first of the day’s warm and golden sun beams, lighting up all the peaks around us. I could’ve gotten used to the 360-degree majestic view for breakfast. 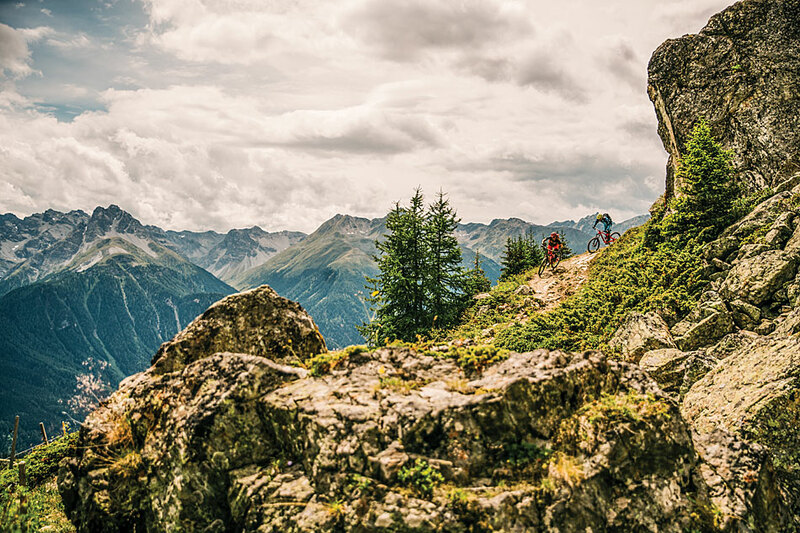 Our legs had recovered from the Scuol adventure, and we were ready to enjoy this beautiful beast. 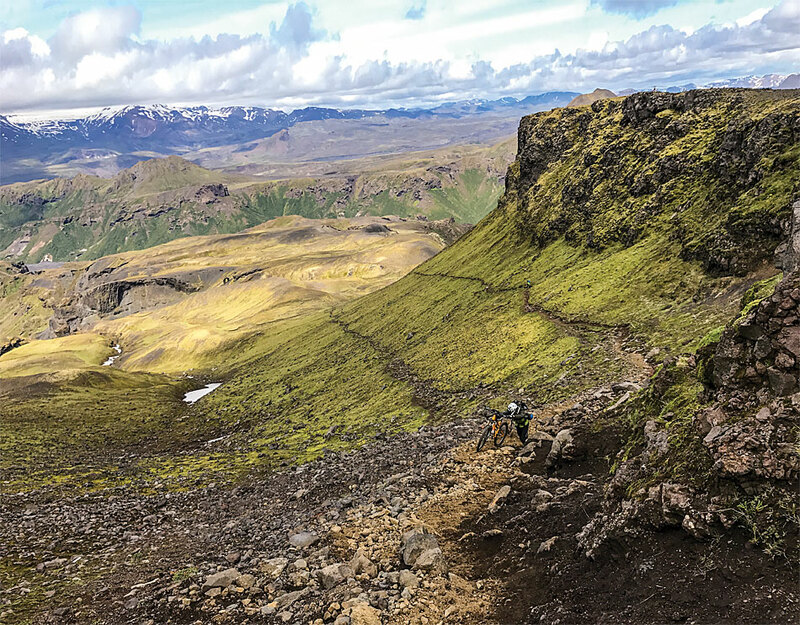 High expectations were quickly matched by reality, as the first few kilometers of the trail escorted us through some of the most impressive terrain I’ve ever ridden. 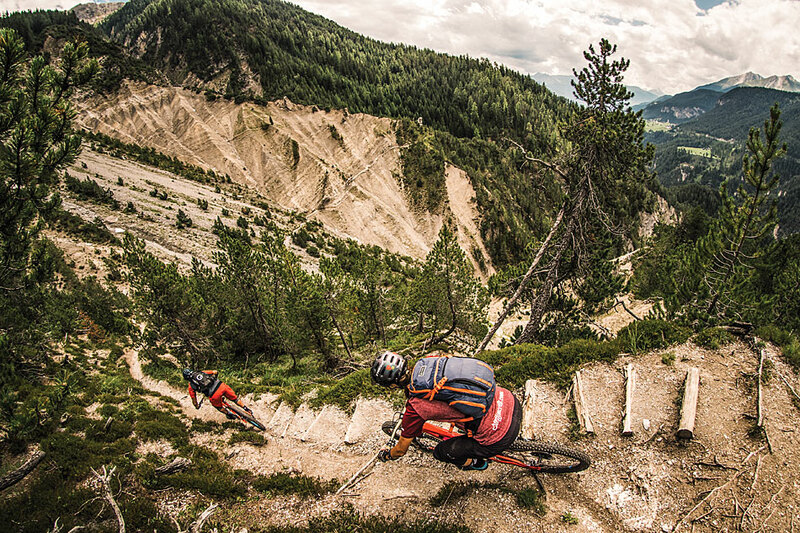 After a few turns, Richie asked me to ride a section close together for a 360-degree video. I’m glad he was riding behind me; otherwise, it would have been hard not to laugh at his Teletubbieesque camera decorating the top of his helmet. 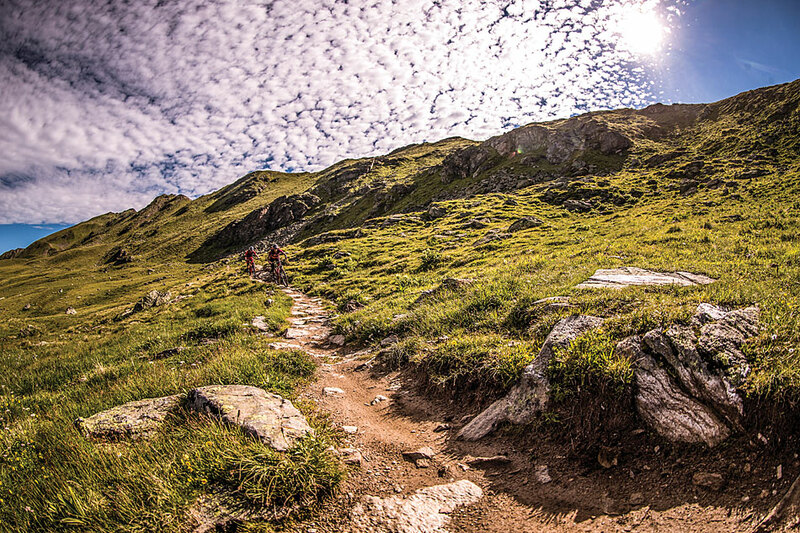 Alps Epic Trail Davos is a super-technical tour with small and large rocks and everything in between. I tried to ride it like a giant pump track, but, of course, it wasn’t easy to keep smooth legs and arms for long. And, dang, there it happened again; I had my third flat in three days of riding. In my defense, I’m not usually one for punctures! Then again, I do find myself getting easily distracted here. The struggle to keep my eyes on the trail was real! This was the only downside of these epic views. The scenery changed dramatically with every other turn as we made our way down into the valley. Ale found one great angle after the other, and we didn’t mind riding a couple of sections two or three times, as we loved the shape of these super-fun high berms. Together with our guide, Michi Wild, we decided to leave out a bit of the climb and took another gondola up to Rinerhorn instead. 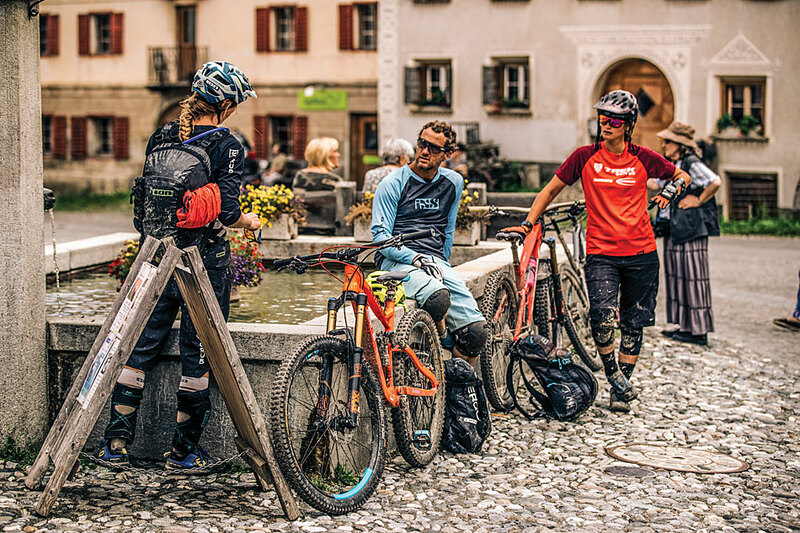 The infrastructure in Graubünden seemed perfectly geared towards us bikers; all too often we’re very much an afterthought in the winter tourism scene. Although we thought we’d skipped the hard part, Michi told us that it was about to get seriously physical now. 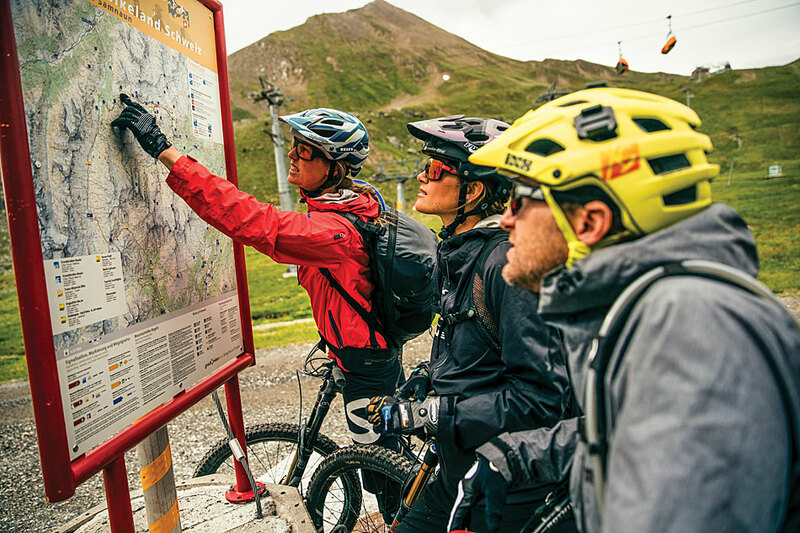 And, as I said before, from the mouth of a Swiss guide, that meant it was time to buckle up! 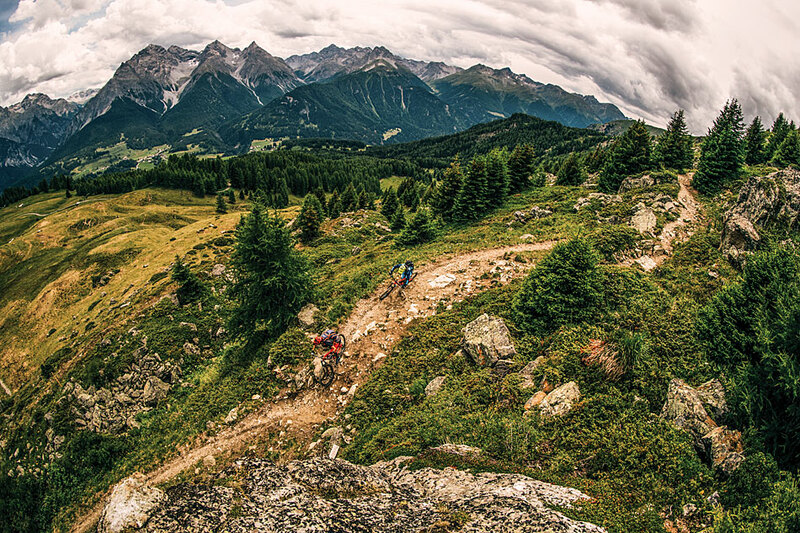 We now find ourselves on a narrow singletrack traversing up and down along the valley in the direction of Monstein. After a super physical two hours, I started developing tunnel vision. Nothing mattered other than trying to survive and keep on Ale’s back wheel. For a photographer with heavy gear, he was surprisingly fit and super comfortable on the technical terrain. About another hour later, we stopped for a long, overdue lunch break. Perfectly synchro- nized, we fell into our chairs and ordered food and drinks without even looking at the prices. 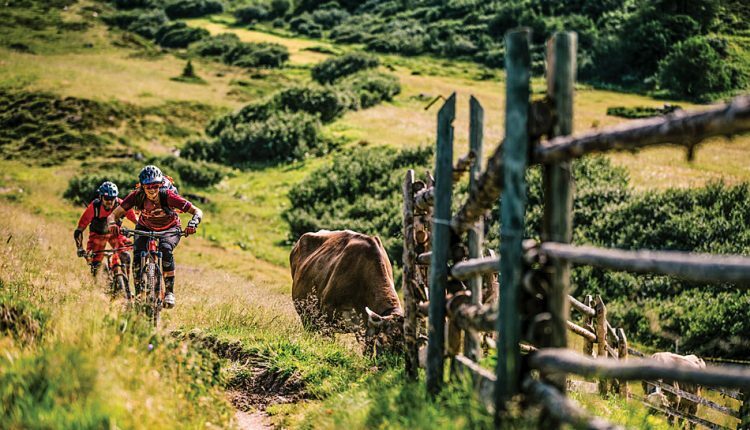 It’s a bit of a trap in Switzerland and a reason why some mountain bikers tend to be wary of the place. It is really a little economic island in Europe; people here earn more to spend more. 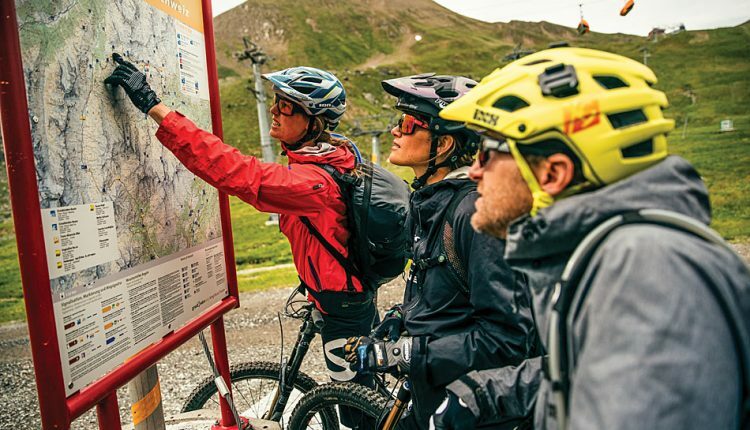 It’s a tough call for tourists from other countries, but honestly, this is definitely a case of “you get what you pay for.” I’ve ridden all around the world, and I am sold on the high-alpine experiences we’ve had the last couple of days. 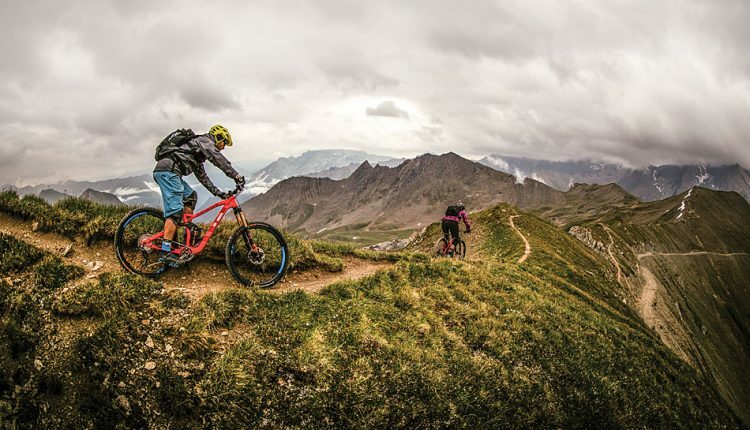 It seems so easy to get around with your bike and to access this amazing, world-class terrain. If Michi had not promised us a “spectacular highlight” coming right up, we would have found it difficult to give up this chill- out zone. 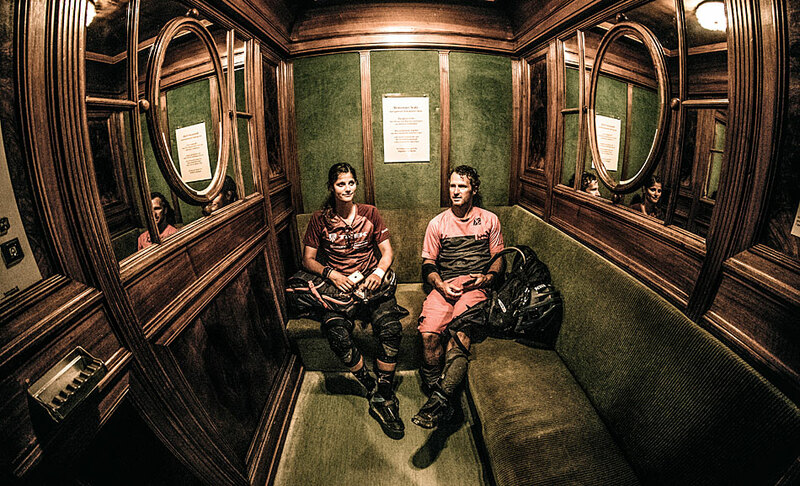 A couple of up-and-down-trail kilometers later, Michi and Richie stopped at the end of a climb. I only heard Richie screaming, “You have to see this, Ale!” We were in the middle of a forest, and I couldn’t imagine what could be so special about it. I was also thinking that I was a bit too tired to get stoked about pretty much anything right now. 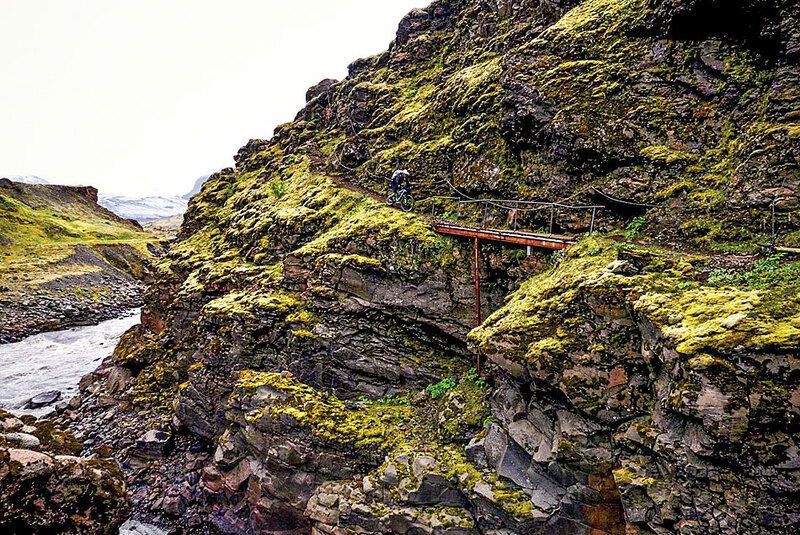 Still, I arrived at the edge of something that looked like a massive quarry with a trail supported only by wooden beams cutting right across it. It looked super scary to traverse this steep rocky wall, but Ale had a shot set up within seconds and was ready to push the trigger. 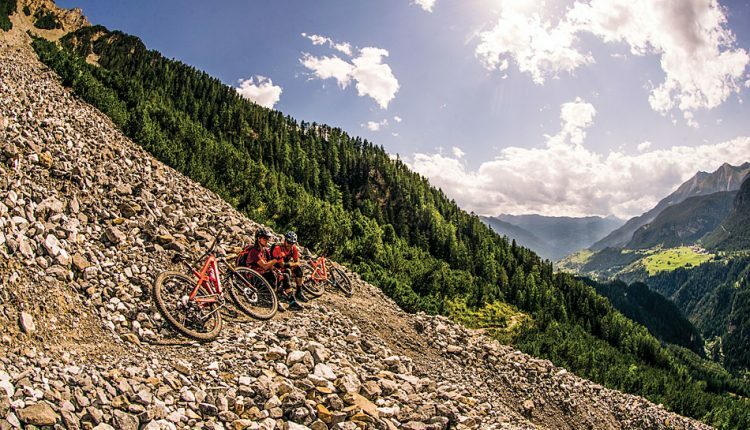 Richie was, of course, an original freeride legend, and I was stoked to get to ride this part together, as it definitely looked “freeride.” Worried about the fact that even Richie had second thoughts about some bits of this little trail, we both committed and dropped in. I totally forgot how tired I was during this intense adrenaline surge, and we ended up riding it a couple of times. Then I saw Ale with a smile on his face and I knew it was all worth it. 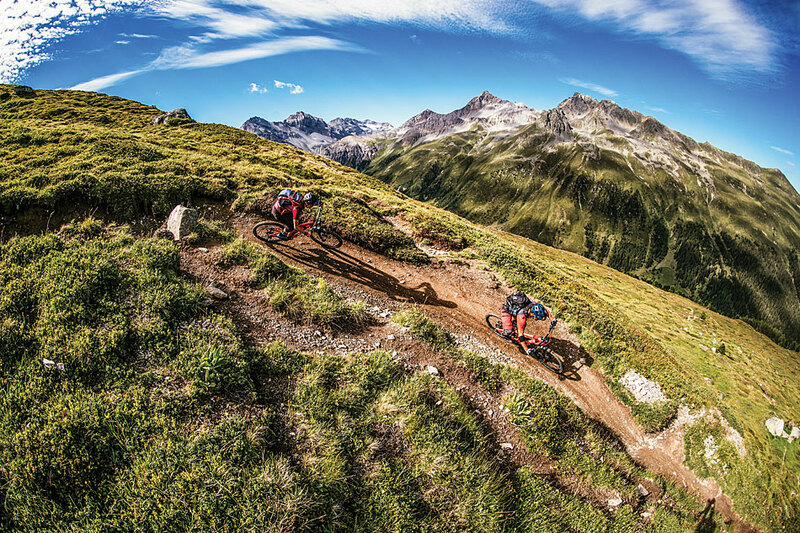 From there we only rode downhill and were going crazy fast in places. 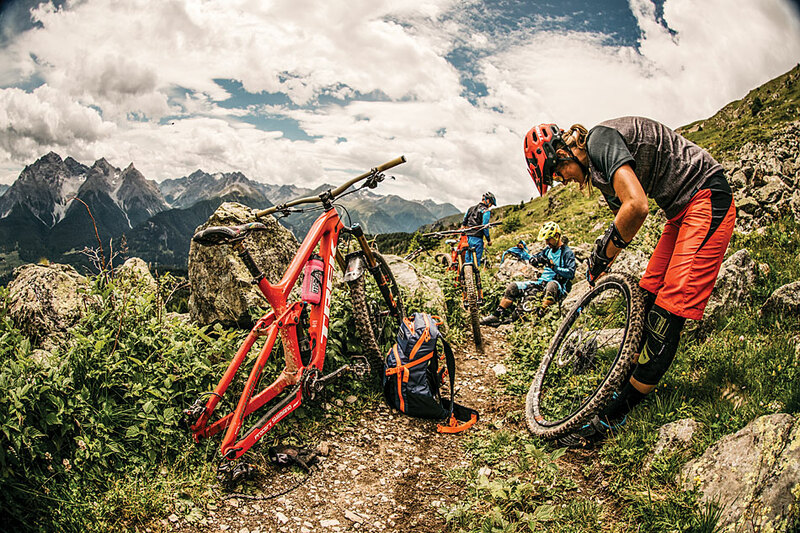 It was fun and at the limit, the most addictive kind of riding. You know how people always say you mustn’t call your last lap? To reach the next train on time, however, we needed to hurry, because it only leaves once an hour. After finally seeing the Rhaetian Railway train station in Filisur with its traditional architecture and a friendly little kiosk with tables and chairs outside, I thought to myself, “Okay, maybe this does look a bit like Disneyland after all.” Although the train was already at the platform ready to leave, we couldn’t board without something cold and refreshing—ice cream and beers did it for us. This was perhaps the most relaxed return ride ever. Maybe this also had to do with the fact that we were completely cooked from this amazing full day of riding. I can only hope it doesn’t take another 10 years until I get to ride with these guys again! If that’s the case, though, I hope we come back.